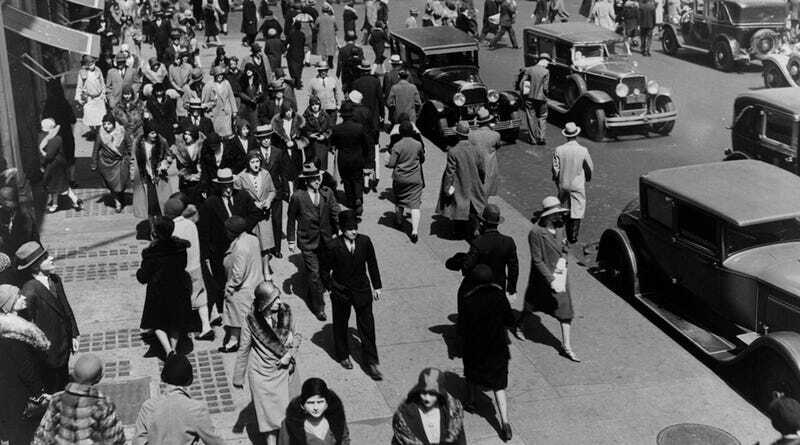 Ever wonder what New York City sounded like in the 1920s? Not the music or even the individual people, but the ambient noise—that swirling mix of life in America's biggest city? Thanks to historian Emily Thompson, that idle question now has an interactive answer. Thompson, author of the 2004 book The Soundscape of Modernity, worked with designer Scott Mahoy to create The Roaring Twenties, an online project that helps transport those of us here in the 21st century to a version of New York City that was experiencing incredible change. Alcohol was illegal, women had just gotten the vote, and cars were flooding the streets. And in a way, you can hear it all bubbling up through the sounds of pneumatic drills, deliverymen, and sirens blaring throughout the city. It should be noted that while the project bills itself as the sound of the Roaring Twenties, many of the sounds were recorded between 1930 and 1933. A small point, but an important shift in American history (the stock market crashed in 1929, kicking off the Great Depression) that can't be overlooked.